Three external locks, available from PEL Supply, offer Fillauer function and quality in a new modular design, suitable for use with any 36mm threaded adapter. Using high-strength titanium cores, each lock offers a 300-lb. weight rating. The External Shuttle Lock uses the same simple, rugged, tool-steel lock insert found in other Fillauer shuttle designs. The clutch insert has a greater density of engagement teeth and a left-handed thread to avoid loosening. The adaptable Razor lock is an ultra-thin nickel-plated design with through holes to allow any number of distal attachments. Model 1017 is a modular, lever-lock knee joint with a locking mechanism that will automatically engage when the joint reaches full extension. The modular design increases manufacturing options and allows for easier maintenance of the orthosis. The long, angled lever is easily operated by the patient and can be shortened or contoured to suit individual needs. Model 1017 comes with an optional anterior pull-cable that allows the patient to simultaneously disengage both locks by pulling on it. Our new Universal Attachment Plate is meticulously machined from Nylon 66 material, making the unit extremely light and strong. The attachment plate far exceeds torque recommendations, due to a full ¾-in. threaded four-bolt pattern. The helical sidewall configuration makes this unit ideal for diagnostic, laminated, and thermoplastic socket attachments. It comes equipped with the necessary screws, and the price is out of this universe. The Alpha® Flex Sleeve features Kevlar®-reinforced Alpha gel for greater durability, greater puncture resistance, and greater abrasion resistance, while still providing increased range of motion. 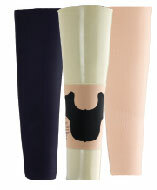 Alpha Flex Sleeve fabric is highly flexible and provides comfort and flexibility when wearing. Designed to use with the LimbLogicTM VS, the Alpha Flex Sleeve is also compatible with traditional suction and locking suspension methods. 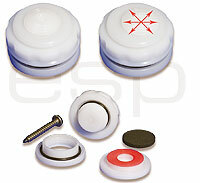 An interior polyurethane pad at the socket brim line provides extra protection for sleeve longevity. Available in black and buff fabric. The sleeve has a 90-day warranty. 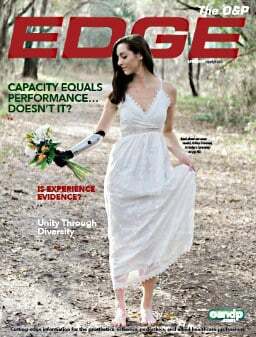 The BRAE Orthosis manages forearm-rotation contractures using a static, progressive stretching protocol. 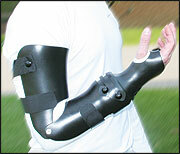 The orthosis treats forearm contractures caused by upper-extremity fractures and injuries. Forearm rotation is adjusted by means of a dual-offset channel with a patented overlapping,adjustable rotation component. Friddles Orthopedic is proud to now offer the Royal Flush line of socks from Royal Knit. These wonderful socks stretch in both length and width, are form fitting, andthe best partare simply wash and wear. The Royal Flushsocks are latex free, resist shrinking, and are odor and mildew resistant. They are offered with and without a distal rubberized reinforced opening. Visit us online for pricing. Brightree for O&P A new way. A better way. Brightree is a proven solution that gets you paid faster and manages all aspects of your business better than ever. 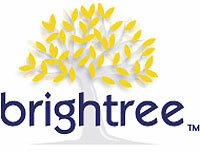 Brightree is the only solution of its type endorsed by VGM and OPGA. State-of-the-art data center: secure, Internet-hosted platform and automated IT management. Billing: real-time Medicare eligibility; automated eClaims; on-demand EOBs; and remittance management. This unique new liner protects against bacteria that cause odor. By using the natural antibacterial effects of Sanitized® silver, the SiliconGel Liner 6Y75 preserves the material, helps improve hygiene, and protects against odor. The SiliconGel Liner is durable yet soft and is ideal for people who meet low to moderate activity levels. Available in 15 sizes, it is ideal when used in combination with 6A30 or 6A20 shuttle locks and is retrofittable with the current SiliconGel 6Y70 liners. Contact your local sales representative to find out more! Allsport WristTM products help restore functional and structural characteristics of the wrist that have been negatively affected by injury. All Allsport Wrist models are designed to enable patients to return to activities sooner, while reducing the risk of reinjury, even in activities with a high incidence of wrist trauma. 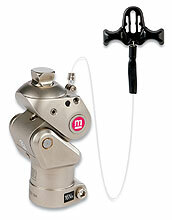 The patented biaxial articulating hinge system limits extension and flexion, as well as ulnar and radial deviation. 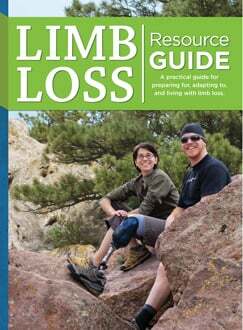 The open-palm design is comfortable and limits the obstruction of the patients grip. The rigid dorsal frame provides stability and support. Available in custom and off-the-shelf models. The OFM2-HD boasts an innovative combination of friction-brake and manual-lock features. Easy conversion between functions allows changes between K1 and K2 activity levels. See page 31 for details on our OFM2-HD promotion! The new Lyn Valve RV SLIDETM by ESP is compact, reliable, and easy to use. The RV SLIDE provides reliable auto-expulsion with the added feature of maintained, hands-free operation. Simply slide the operator button in any direction, and the valve stays open, eliminating back-pressure for easy prosthetic donning and doffing. Auto expulsion with ½-psi release pressure. 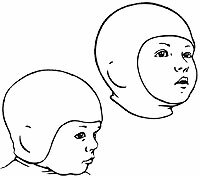 Designed for children who wear a cranial orthosis, Knit-Rites new Infant Cranial Interface is used to protect the skin, wick moisture, control rashes, and guard against dermatitis. If skin eruptions occur, changing interfaces two or three times a day and washing the head area and garments daily are helpful. Available in Mullet and Balaclava styles and in both anti-microbial CoolMax® and X-Static®. Dycors ADL-LCD Lisfranc/Chopart Energy Returning Foot provides maximum flexibility and resiliency, strength of attachment, and anatomical support of hindfoot, with minimum weight (12.5 oz. 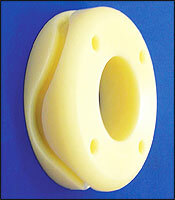 with foot shell, 26cm med) and socket clearance (3/8 in. including foot shell). The forefoot is horizontally split into five segments to maintain the same degree of forefoot flexibility, regardless of medial and lateral shift of the floor reaction. 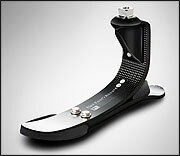 Integrated carbon fiber "tie-ins" around the heel portion of the keel are epoxied directly to the end of the socket, forming a stronger lap joint between the heel segment of the keel and the prosthetic socket. Acor Quikstrip® Wheels are sheets of materials in easy-to-use wheels. The 4½-in.-wide strips are available in many different material combinations. Quikstrip Wheels improve fabrication efficiency, minimize wasted materials, and decrease the bulk of flat sheets. The protective dispenser box keeps materials clean and dust-free and reduces damage to the product. 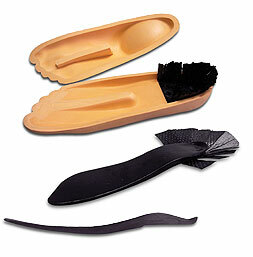 Perfect for making foot orthotics. Matthew Dobbs, MD, designed this new dynamic clubfoot bar to allow active movement, preserve muscle strength in the foot and ankle, and be less restrictive to the child than traditional fixed-bars. Children using the Dobbs Bar can crawl and kick their legs independently. Children will sleep better because they can get comfortable in the DobbsBar, and heel blisters commonly associated with fixed bars are no longer a problem. The Dobbs Bar is adjustable from 8 to 14 inches to accommodate growth; no need to buy replacement bars. The foot plates are universal and can be attached to shoes and AFOs. The results are better compliance, a more active child, and happier parents. These seam-free, wrinkle-free AFO and KAFO socks for kids now come in pink, purple, blue, grey, and black, as well as traditional white. 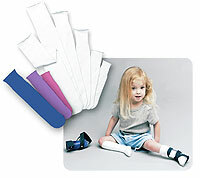 SmartKnit KIDS AFO and KAFOsocks feature a "heelless" design to ensure a perfect fit every time. Each sock is knit with CoolMax®, polyester, or X-Static®the silver fiber with spandexfor superior moisture wicking and antimicrobial properties to inhibit bacteria for improved skin health and odor control.